Heat oven to 425°F. Grease 12-inch pizza pan. Mix Bisquick and hot water until soft dough forms. Press dough in pizza pan, using fingers dusted with Bisquick; pinch edge to form 1/2-inch rim. Bake 10 minutes. Mix sour cream, onion salt and eggs; pour over crust. 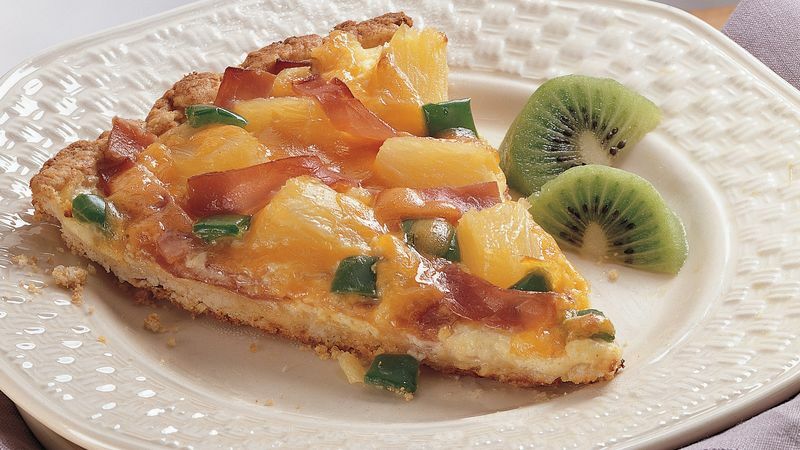 Layer bacon, cheese, pineapple and bell pepper on egg mixture. Bake about 25 minutes or until set. Cool slightly before serving. If you don’t have a pizza pan, press the dough into a 13-inch circle on a greased cookie sheet, using fingers dipped in Bisquick. Pinch the edge to form a 1/2-inch rim. After you grease the pizza pan, sprinkle it with cornmeal for an extra-crispy crust.